Witnessing others’ appreciation for your art is an incredibly gratifying moment for any artist. 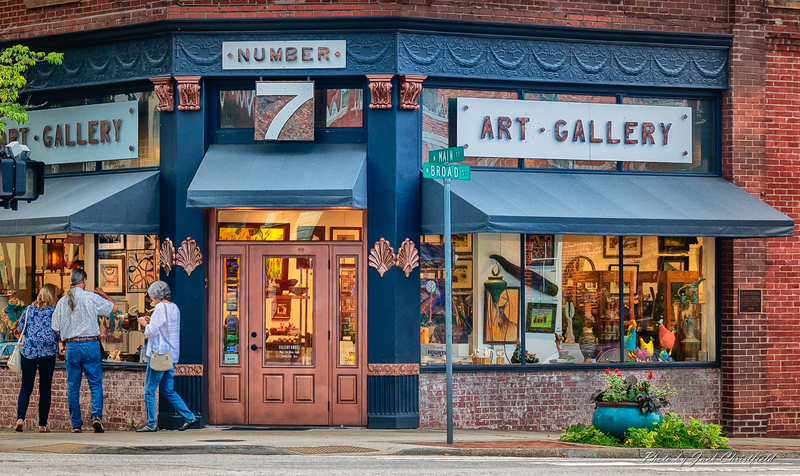 Multiply that feeling by 35 artists and you gain a sense of the positive vibes that surround you when visiting Number 7 Arts, Brevard North Carolina’s longest continually operating gallery. The spacious, modern gallery with gleaming hardwood floors and movable walls is a work of love by its artists and the entire Brevard Community. Visitors discover an unsurpassed variety of fine arts and crafts, all locally created. It wasn’t always so. As a small town lying just west of Asheville, beneath the 6000 foot peaks of the Blue Ridge, Brevard has long been known for its outdoor activities, the Brevard Music Center and Brevard College, but perhaps less so for its art, with Asheville taking the spotlight. In 1998, a group of five Transylvania Community Arts Council (TC Arts Council) leaders decided to help change that. They would create a non-profit, self-sustaining program, overseen by the council, where local artists could develop their skills in showcasing, promoting and selling their work. It would be a place to promote the arts and foster a sense of community pride between TC Arts Council, the gallery and the public. An outside juror was brought in and nineteen founding artist members were chosen to display their work and man the gallery which opened March 4, 1999 in a small unoccupied store on Main Street. Throughout the years the original concept of encouraging artist to push the boundaries of their medium and learn all they can about the day-to-day gallery operations has been a central theme. Members must pass a thorough jurying process that includes an interest in promoting not only their work, but the work of their fellow members. While the gallery managed to support itself financially, it was a huge struggle, especially through traditionally slow winter months and during the 2008-2010 economic crisis. While other galleries were forced to close their doors, Number 7 Arts’ locally made fine arts and crafts kept the little gallery going. Then, in 2016, members discovered the building they were renting would be sold. As it had done for almost two decades, gallery members stepped up. A steering committee was formed and a search begun. Space became available in The McMinn building, Brevard’s oldest commercial building. The location was perfect, on the corner of Brevard’s Main and Broad streets across from the town’s historic courthouse, but it was a much larger, more expensive space, in need of major repairs and renovations. On the plus side the expanded space would allow the cooperative to jury in additional outstanding local artists, increasing income as well as the amount and variety of art displayed. Fortunately, Number 7 Arts members possessed a variety of experience. Teams were formed and assigned various duties: finance, community relations, fundraising and construction. A rental contract was signed in August and artist member Holland Van Gores, an experienced contractor and woodworker, was placed in charge of the renovation while fiber artist Ann Parkhurst, a longtime community member, took over fundraising team efforts. TC Arts Council gave the program a $12,000 grant to jumpstart things and The Heart of Brevard promised another grant, but it was a group of local art patrons, The Friends of Number 7 Arts, who led the way with donations as people and businesses throughout the community joined in with contributions both large and small. On November 1st, 2016, Van Gores, joined by various artist members and their spouses, began the demolition and restoration process. One of those spouses, Michael Rosenthal, a retired retail space designer, drew up design plans for the interior and exterior. Not surprisingly, the renovation required structural as well as cosmetic work. The historic old building also revealed some surprises, like an early 1900s cash register and hand-written prescription receipts, many for $2 or less, from the space’s time as a pharmacy and soda shop. Throughout the almost three-month process artist members who could not help with construction took over the day-to-day manning of the old gallery, keeping up sales and income from that source. By the end of January, 2017, artists could be seen carrying work from the old space, across the street to the new. Bruneau team staged the new space while Van Gores’ team finish the building façade restoration. When the new Number 7 Arts opened its doors on January 20, more than 3,000 artist work hours and $70,000 had been donated and the community had a new showplace anchoring its growing reputation as a mecca for the arts. Thus far, the move has more than paid for itself, with sales doubling highs of previous years and making the little, non-profit cooperative begun almost two decades ago, a truly self-sustaining, not-to-be-missed centerpiece for the arts in Brevard. We wish to thank those who played key roles in making it all happen, especially our Friends. Number 7 Arts founders: Jinks Ramsey, Cindy Platt, Bob Masengill, Susan Threlkel, John Candler. Kathy Mlay, Arnold Mlay Insurance Agency, Inc.